Now, interspersed within the Adventures of Chow City chronicles and other nonsensical restaurant paeans and food-related ravings that make up Fried Neck Bones…and Some Home Fries, comes the debut of a new semi-regular installment called The Happiest of all Hours. Focusing on the saloon equivalent of Neckbones-like eating establisments, The Happiest of all Hours will attempt to capture what it is that makes that hour (or hours) so very happy. 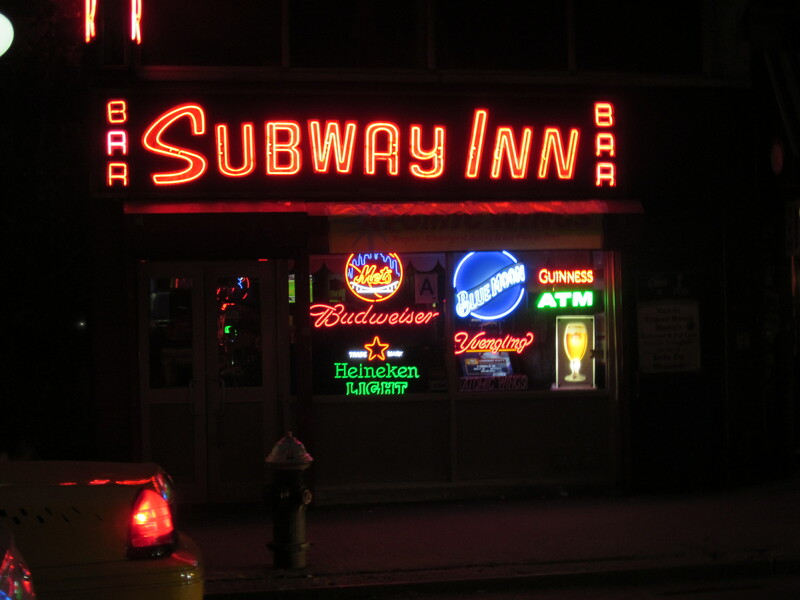 To lead off the series comes the Subway Inn Edition. 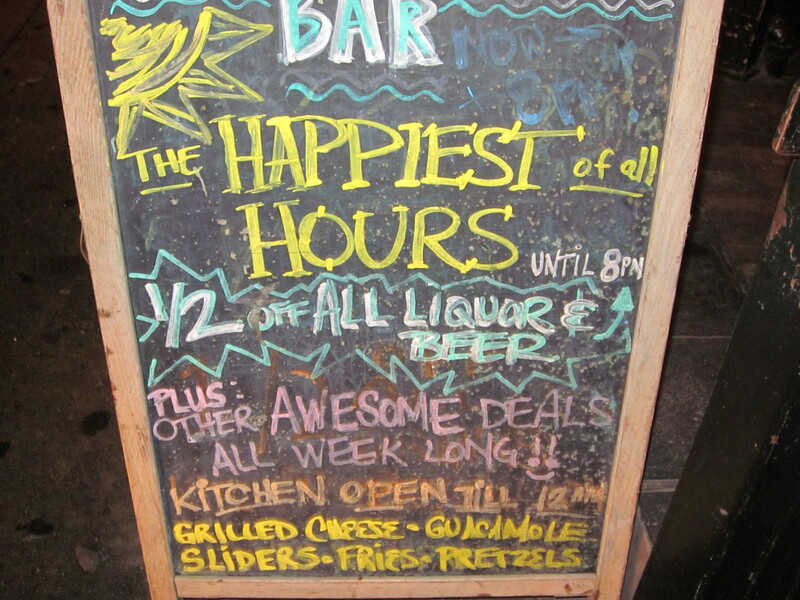 No stranger to the Subway Inn, it seems whenever I go, it’s the happiest of all hours. But it had been a long time between visits. Upon entering, however, not much had changed with the exception of an abundance of flat panel, high definition televisions scattered throughout. 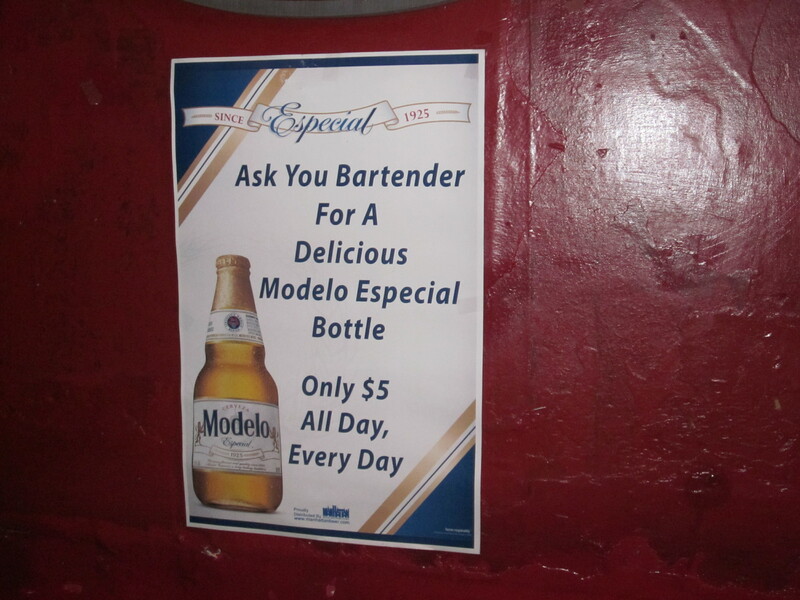 And the presence of Modelo Especial in bottles. Averting my eyes from one of the many aforementioned high definition television screens, I glanced upon the mantle above the bar. 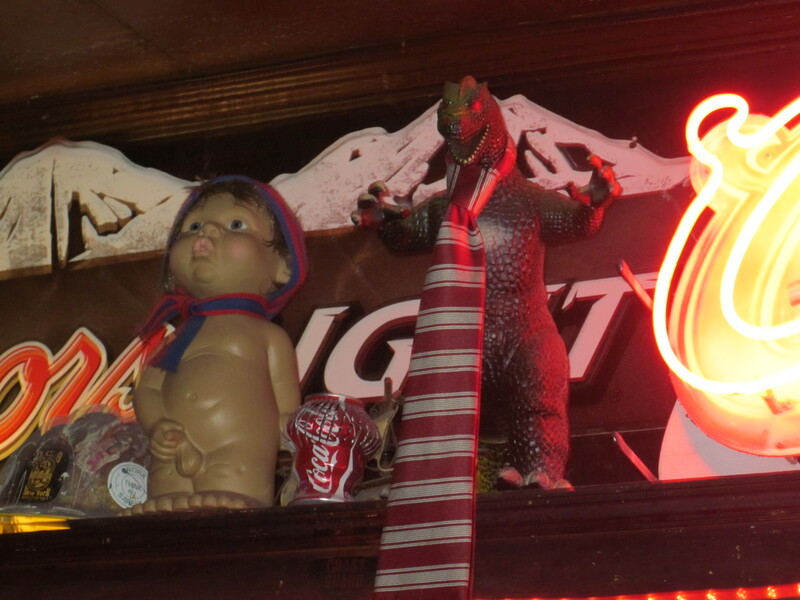 Ah, yes, Godzilla wearing a tie. But I just can’t find the right words to describe the mate next to him. Could it be a signal that the happiest of all hours should come to a close? 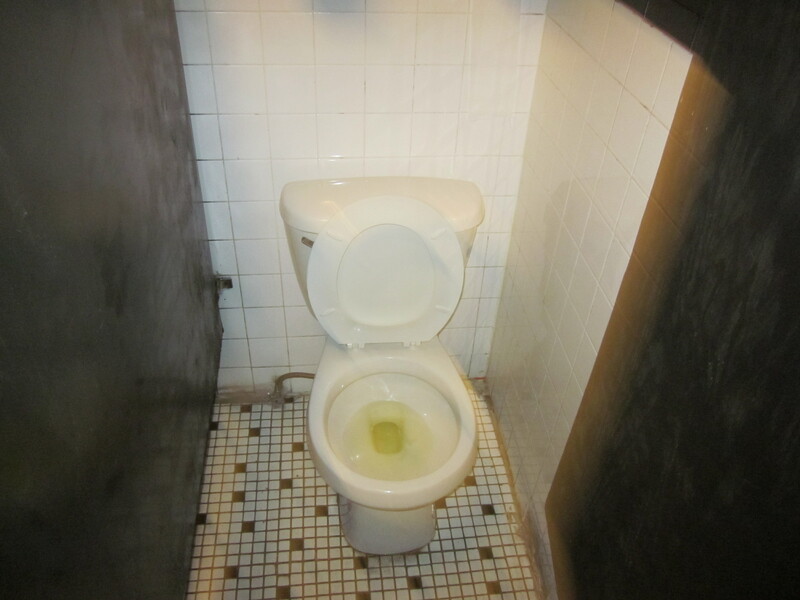 Before leaving the Subway Inn to travel on the subway home, a visit to the facilities is almost always necessary. 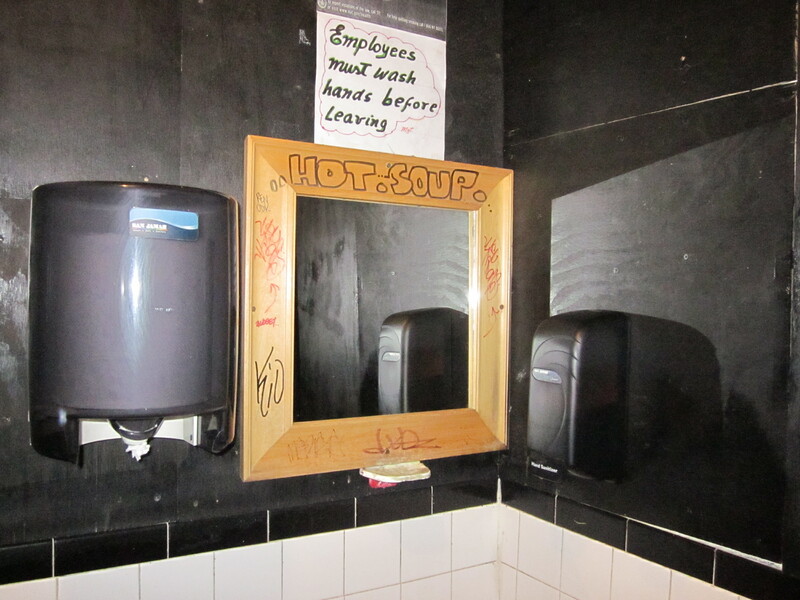 I have a very painful memory about a happy hour past at Subway Inn when nature urgently called and the facilities were off limits; blocked by a posse of plain-clothes detectives as they used said facilities to conduct a drug shakedown of some of the bar’s more devoted patrons. I swear, the seat was already up. 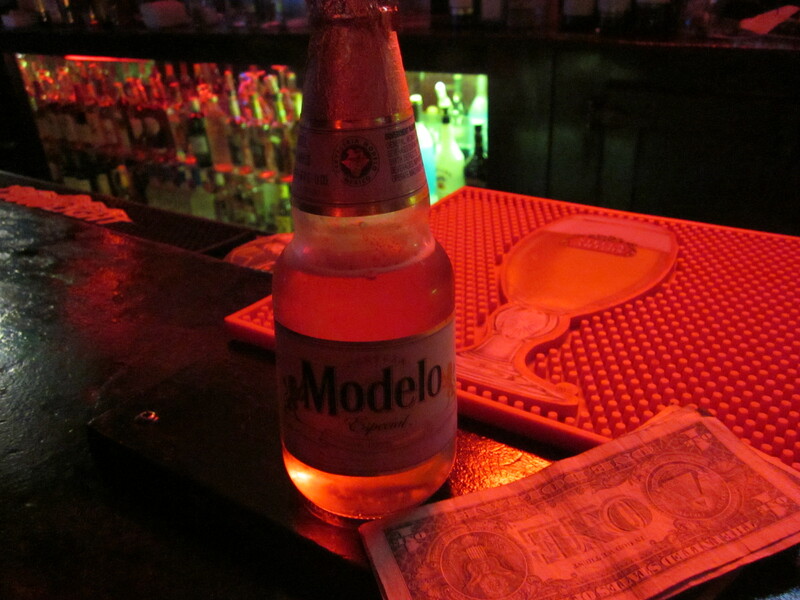 On this happiest of hours, I am happy to report, there was no such dilemma. I don’t get around as much as I used to, so if any of you have suggestions or recommendations of establishments that might make good additions to The Happiest of all Hours, please don’t hesitate to contact me at friedneckbones_andsomehomefries@yahoo.com. Wow you’re lucky you still get for go there as Carrie forbids me after she claims to have gotten fleas when we visited some 15 years ago! However,your taste in watering holes is similar to mine. Have you tried the ‘ beer bar’ at whole foods Columbus circle? It is wonderful for anaesthetizing yourself before submitting your retirement fund as payment a weeks grub.